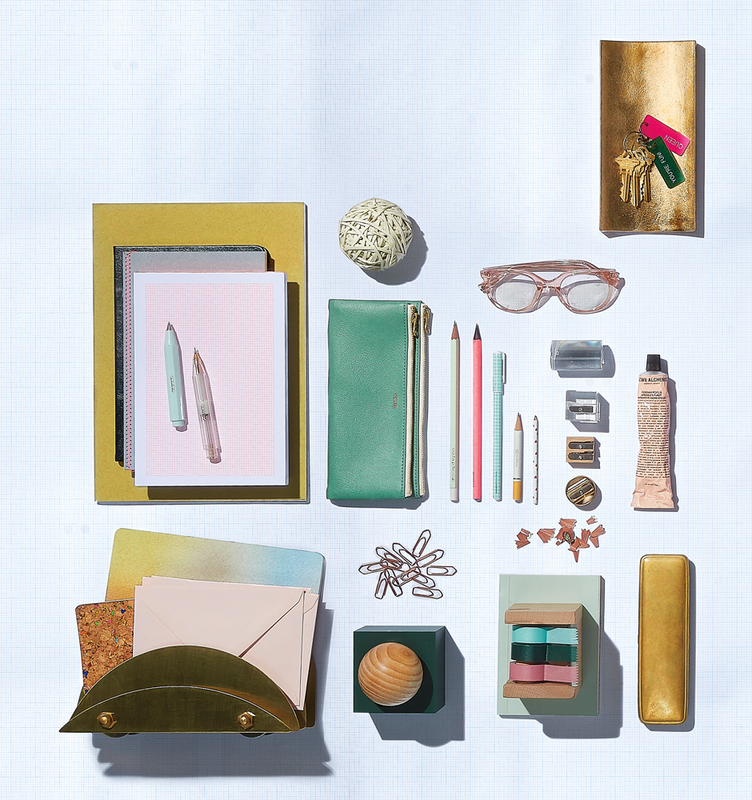 Crisp blank notebooks, a slim leather laptop case, new erasers in bubblegum pink—update your desk for fall with these smartly designed essentials. A4 Notepad lapetitepapeteriefrancaise.fr; Moment Notebook poketo.com; Mrs. Stitches Notebook happilyeverpaper.com; A4 Quadrille Neon Pad by Le Typograph dijitalfix.com; Clutch Lead Holder and Mechanical Pencil by Kaweco mcnallyjacksonstore.com; Double Fastener Pen Case by Craig domino.com/fall16; HB Pencils by Craft Design Technology cwpencils.com; Neon Pencils by Nomess neo-utility.com; Pattern Pen by Livework thefoxandstar.co.uk; No Smoking Mini Pencil by Eye Ballcwpencils.com; Mini Heart Pencil by Camel Pencil Company cwpencils.com; Round Brass Pencil Sharpener by Dux domino.com/fall16; Wooden Pencil Sharpener by KUMstubbypencilstudio.com; Acrylic Pencil Sharpeners by Dux domino.com/fall16; Chelsea Eyeglasses warbyparker.com; Brass Tray by S/N Japan poketo.com; Keytags by Various Keytags domino.com/fall16; Intensive Hand Cream grownalchemist.com; Brass Pen Case by Midori poketo.com; Hidden Agenda Notebook happilyeverpaper.com; Tape Block by Hay hayminimarket.com; Mini Container by Good Thing domino.com/fall16; Paper Clips by Leone Dellera domino.com/fall16; Physalia Desk Portfolio asapingree.com; Original Crown Mill Folded Cards and Envelopes in Classics C6 theonlinepencompany.com; Cork Sketchbook by Nomess neo-utility.com; The Holi by Papier Tigre thomassires.com.domino.com/fall16; Physalia Desk Portfolioasapingree.com; Original Crown Mill Folded Cards and Envelopes in Classics C6 theonlinepencompany.com; Cork Sketchbook by Nomess neo-utility.com; The Holi by Papier Tigre thomassires.com. Drawing Pad lapetitepapeteriefrancaise.fr; Appointed Spiral-Bound Workbook domino.com/fall16; Alvin Cutting Mat dickblick.com; Spring Scissors by Nomess neo-utility.com; Mini Scissors by Hay hayminimarket.com; Brass Dish by S/N Japan poketo.com; Pushpins by Leone Dellera domino.com/fall16; 365 A6 Notebook by Shinnippon mcnallyjacksonstore.com; Colour Notes hayminimarket.com; MT Masking Tape domino.com/fall16; Stick-Up Weekly Calendar poketo.com; Please Stop Eraser strange-ways.com; Extra-Hard Eraser by Koh-I-Noor mcnallyjacksonstore.com; Tiny Tropical L & C Hardtmuth Eraser by Koh-I-Noor cwpencils.com; Synthetic Rubber Eraser by Milan cwpencils.com; No. 014 Plastic Eraser by Craft Design Technology cwpencils.com; Magic Rubber Eraser cwpencils.com; Blackwing Replacement Erasers by Palomino cwpencils.com; Milan 420 Eraser milan.es; Folio 34 by AANDD domino.com/fall16; Hay Wooden Ruler Cube hayminimarket.com; Brass Ruler by Appointed domino.com/fall16; YStudio Rollerball Pen by YStudio domino.com/fall16; Midori Brass Number Template Bookmark jetpens.com; Sticky Notes by Travellife mcnallyjacksonstore.com; Sediment Tableware by Umbra Shift domino.com/fall16; Klizia 97 Stapler by Ellepi domino.com/fall16.